Diamonds have been a source of fascination for centuries. The diamond is the hardest known substance in the world. 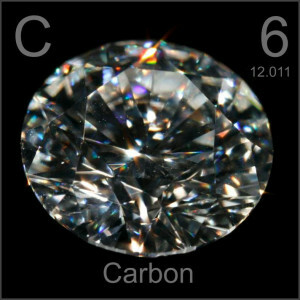 Billions of years ago, in a deep layer of the earth, a unique combination of chemicals, pressure and changes in temperature, created diamonds out of pure carbon. The Diamond is uniquely resistant to damage by heat or scratching, and can be cut or polished only by another diamond. The diamond is thousands of times harder than corundum, the next hardest substance from which rubies and sapphires are formed. Even after many years of constant wear, diamonds will preserve their sharp edges and corners when most other stones will have become worn and chipped. However, many people expect a diamond to be unbreakable. This is not true. A diamond’s crystal structure has “hard” and “soft” directions. A blow of sufficient force, in a very exact direction, can crack, chip, split or even shatter a diamond. Now-a-days Diamond has become ‘The Symbol of Love’ through out the world. The tradition of giving diamonds as tokens of love and commitment began at the end of the 15th century when Austrian Archduke Maximilian gave a diamond ring to his fiancé. They chose to place the ring on the fourth finger of the left hand because legend held that this finger provided a direct link between tokens of love and the heart. The diamond’s strength and pure, transparent beauty have always represented the purest emotions of human heart — commitment and deep, lasting love. When rating the colour of a diamond, jewellers commonly use the letters D through Z. The rating D represents a diamond that is colourless through to the rating Z which has a yellow or brownish hue. As a rule, the closer a diamond is to colourless, the more valuable and rare it is. Though the white colour diamonds are the most popular, there are more rare diamonds that have strong “other” colours which are known as fancy diamonds. The hues of these diamonds can compete with any colour gemstones. These diamonds come in different coluors including very rare red, pink, canary yellow, blue and green and are all highly prized. An important aspect of the allure of diamonds is the way they sparkle. The sparkle is a result of how a stone is cut – its symmetry, polish, durability, and proportion of its parts – which in turn, determines how light travels through the stone and back to your eye. The brilliance and shine we see in a well cut diamond are the result of light being refracted off the facets and through out the stone, and exiting through the table or top part of the diamond. A stone that is cut to “ideal” proportions will allow the most light possible to exit through the table of the diamond resulting in the breathtaking brilliance and shimmer. When a diamond is cut too shallow or too deep, a significant amount of light exits through the sides and bottom of the stone resulting in a lack of brilliance and scintillation. There are also different types of diamond cuts and shown below. The most popular is of course the classical round brilliant which are the “ideal” way how a diamond should be cut. Clarity is an indication of a diamond’s purity. Diamonds frequently have inclusions, or small flaws, air bubbles, scratches or other minerals inside the diamond. The less inclusions a diamond has, the more valuable and beautiful it is. Carats refer to the size of the diamond. Each carat has one hundred points. The carat weight refers to the mass of a diamond. For example, a diamond that is a 1/2 carat can be referred to as a 50-point diamond. But bigger isn’t necessarily better. A two-carat diamond that is cut poorly is not nearly as beautiful as a smaller diamond cut by a skilled diamond artisan. A large carat weight diamond also be cut well, but have poor color and clarity, which again will reduce the price compare to cleaner smaller diamond.